Please copy and paste ' [[Category:Tetras]] ' into the end of your article to include it in this category. Tetras are a varied group of species of different shapes and sizes. All tetras have an adipose fin (a small fin between the dorsal and caudal fins) and some also have teeth in the lower jaw. The tetras listed here all belong to the order of Characiformes and two families, the majority of the common South American tetras belong to the family Characidae sub family Incertae sedis (unknown/undecided), and the minority, the African tetras belong to the family Alestidae. 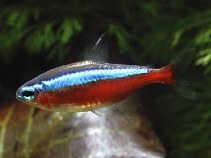 See here for a list of common tetra names. This page was last edited on 26 August 2015, at 15:56.